If you want to make authentic coffee-shop quality espressos and espresso drinks at home, you need to be ready for significant investment. Semi-professional espresso machines don’t come cheap, but they do make far superior coffee. Here’s our Quickmill Andreja Premium Espresso Machine Review. Let’s start by introducing the main features of this machine. Then we can have a look at some of them in more detail. If you are looking for a home espresso machine that can make coffee shop-quality espresso or something extremely close, you will probably already be aware that such machines do not come cheap. That is certainly the case with this machine – if you are looking at machines in this price range, you will be looking for a high-quality machine and you will be expecting it to do the job it is designed for to an extremely high standard. This being the case, the first question we need to answer is, does this machine make exceptional espresso? The answer is simple: yes, it does. If you want great-tasting espresso in the comfort of your own home, this machine will be able to deliver. So apart from its ability to make great coffee, what else makes this machine stand out from the crowd? First, it has a heat exchange boiler system. In essence, there are three main types of boiler systems for espresso machines. A single boiler machine, as the name suggests, has a single boiler that heats water for brewing and for steaming. This means you have to switch between the two functions and can’t do both at the same time. In other words, you can only pull espresso shots or steam milk – you can’t do both. Since the water temperatures for the two functions are not the same, there is also a certain amount of waiting when switching between the two functions as the temperature rises or falls. With a double boiler system, you have a separate boiler for each function, meaning you can do both at the same time and there is no waiting time when switching from one to the other. This is the system used in all top-end espresso machines, but it is also the most expensive. However, a heat exchange system uses a single boiler but includes special technology that allows the advantages of a double boiler system. The only drawback is that you need to do a small “cooling flush” purge before pulling the first shot. Thereafter, you can continue to pull as many shots as you need. Heat exchange systems also allow the water temperature to be controlled more accurately than with a regular single boiler system. The bottom line is, a heat exchange boiler gives you most of the performance of a top-end double boiler system but at a significantly lower price point. In terms of steaming and foaming capabilities, this machine is also a winner. You can expect to produce high-quality silky foamed milk with micro-foam, allowing you to make all your favorite coffee shop drinks to the same quality as in a coffee shop. Another great advantage of this machine is its look. This machine is a stylish, eye-catching unit that clearly announces to everyone that its owner is serious about making coffee. You can be sure that whenever you are entertaining, your guests are sure to want to try your espresso. One final consideration that makes this machine a good practical option for the serious coffee lover is that it can easily be plumbed in, meaning you won’t have to refill too often – something that can become an almost daily occurrence if your machine gets lots of use. This machine is designed to allow you to make espresso like a professional trained barista. While the heat exchange system is somewhat more forgiving of minor flaws in your espresso technique – you will still be able to pour great tasting coffee even as you work on mastering the art – you will need a certain amount of expertise to be able to pour professional-quality espresso. This means if you are more interested in drinking good coffee with a minimum of fuss rather than learning how to become an outstanding barista yourself, there are other coffee machines available that automate the process, making it all much simpler. 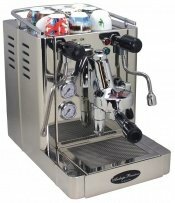 Overall, this is a top home espresso machine and although it is not cheap, as a functional, attractive and high-quality machine, it still represents excellent value in this price range. We have also scoured the internet for you to find out what other people are saying. There are plenty of other reviews out there, and you can find many more on YouTube – but here’s just one video review to show you what other people think about this machine. This machine has dimensions of 11.25” x 17.5” x 15.5” and weighs 55lbs. It uses a heat exchanger boiler to give you the advantages of a double boiler system but at a lower price point. It features a swivel no burn steam arm to allow you to produce coffee shop-style steamed milk with micro-foam. It also includes a swivel stainless steel water tap. There are two pressure gauges, one for the boiler pressure and one to tell you the brew pressure. On top of the unit is a cup warming tray large enough to store 12-16 espresso cups. 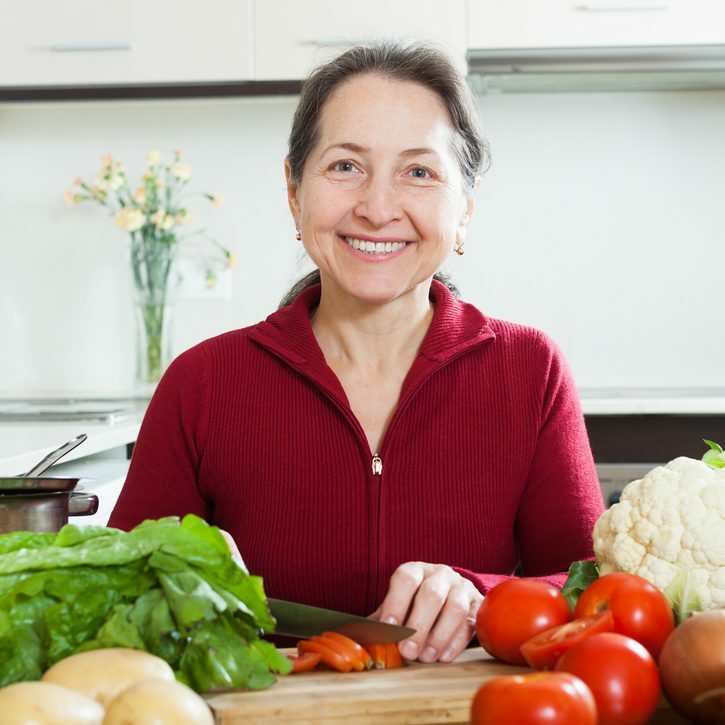 The machine has a tank that needs refilling manually – but it is also possible to plumb the machine in to avoid the need for manual refilling. For best results when using this machine, you need to allow 25 minutes for it to heat up before you can start pulling shots. If you want your espresso in a hurry in the morning, you might be better off fitting a timer so that it will come on automatically. When using a high-quality espresso machine of this nature, it is even more important to make sure you use a top-end burr grinder. If you use a cheap grinder, you will not be able to produce the superior espresso this machine was designed to make. 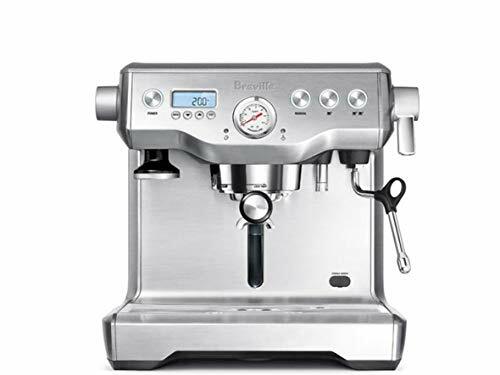 If you prefer a dual boiler system but at a similar price point to the QuickMill Andreja, you might consider this model from Breville. It features a double boiler, allowing you to steam milk and pour espressos at the same time, and it also controls the temperature very accurately. It features an over-pressure valve to limit extraction pressure and also has a digital LCD display. One advantage this machine has over the QuickMill is that it also has a descale alert to tell you when you need to clean it. It also features an LCD-aided descaling sequence. This is an ideal pick for someone who specifically wants a double boiler system rather than a heat exchange system. 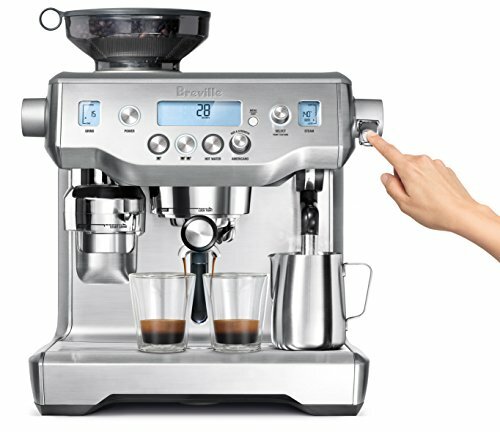 For those who are more interested in the final product rather than the brewing process, this all-in-one super-automatic system from Breville does everything for you. All you need to do is put the beans in the hopper, add water and choose the drink of your choice – the machine takes care of the rest. 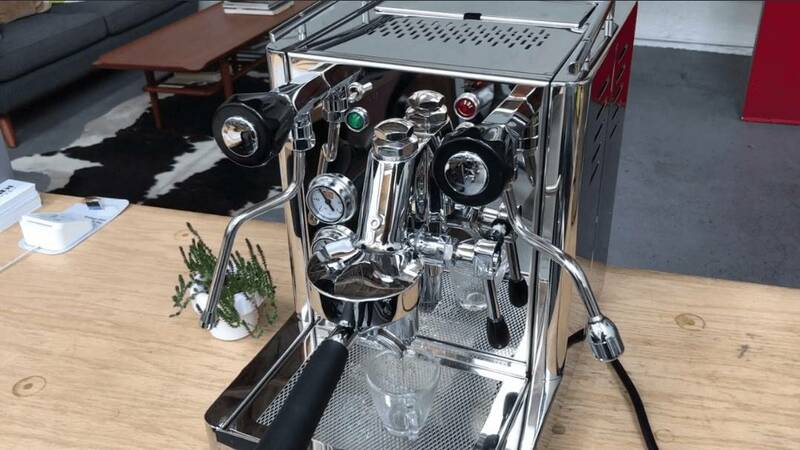 If you want everything done for you and you don’t want to waste time becoming a superstar barista yourself, this might be the machine for you. If you prefer to control the espresso-making process manually yourself, you might prefer a more traditional model. If you are looking for a high-quality espresso machine that will free your inner barista and allow you to enjoy perfect, coffee shop-standard coffee from the comfort of your own home, as we have seen in our QuickMill Andreja Premium review, this could be a great pick for you.